When I tell people I grew up on Long Island, most people think that I grew up Where Everyone Else On Long Island Did. Namely, Nassau County, near Manhattan and Civilization. But, that is Not The Case. 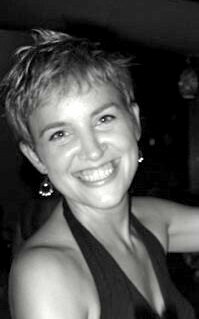 I actually grew up in A Very Small Town on the Eastern Portion of The Island. There were a lot of Farms. Like, Potato Farms! And Sod Farms! And Peach Farms! Most of these farms were open to the public to U-Pick, which meant that you grabbed a crate and went out into the field and selected your own Fruits And Vegetables. My Family and I did this A Lot. It was always Fun! 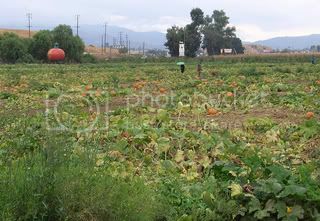 When My First Lost Angeles Halloween came around, you can imagine How Disappointed I was to learn that "Mr. Bones Pumpkin Pick Your Own Pumpkin Patch" was just An Empty Parking Lot, Covered In Hay. And that The Pumpkins Were Not Actually Growing Out Of The Ground! Poor, Sad, Los Angeles Folk! 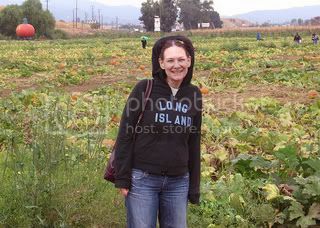 A few years later, after Easily Annoyed Sister had Moved Out To Los Angeles Because She Didn't Feel Annoyed Enough Back Home, she located A Real Life Pumpkin Patch! It was about An Hour And A Half outside of Los Angeles, but it was Well Worth The Drive. The Pumpkin Patch indeed had U-Pick Pumpkins, as well as A Petting Zoo! And Kettle Corn! And Bales Of Hay! We had lots of Fun. 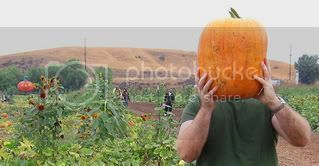 Naturally, I had to Drag Take Totally Awesome Boyfriend out there this year, as I Refuse To Purchase Previously Picked Pumpkins From A Fake Pumpkin Patch or Vons. We had A Totally Awesome Time! 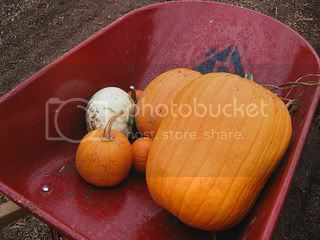 And now, I present our Totally Awesome Pumpkin Picking Photos for Your Blog Photo Viewing Pleasure! Please Enjoy! This is The Pumpkin Patch! 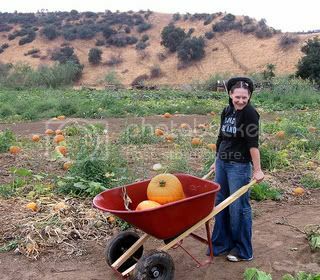 This is Me Pushing A Wheelbarrow Full Of Freshly Picked Pumpkins! Here is An Exciting Close-Up Of Those Freshly Picked Pumpkins! Look! 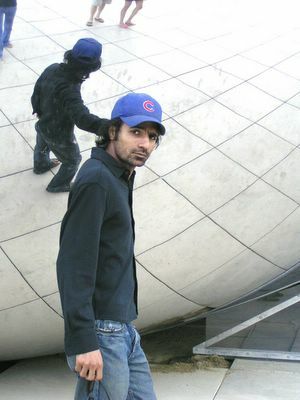 Finally, A Photograph of Totally Awesome Boyfriend! These Poor Pumpkins may look So Peaceful, sitting on Totally Awesome Boyfriend's Table, but they have No Idea that In Two Weeks, we will take Very Sharp Knives, Cut Them Open, and Carve Faces in Their Shell. Run, Pumpkins, Run! 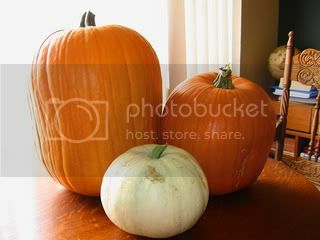 You sure are a cute li'l pumpkin, but your bf looks like he's making out with one. Now I know why you wanna carve em up. Those fruity floozies better be on their gourd. HA! 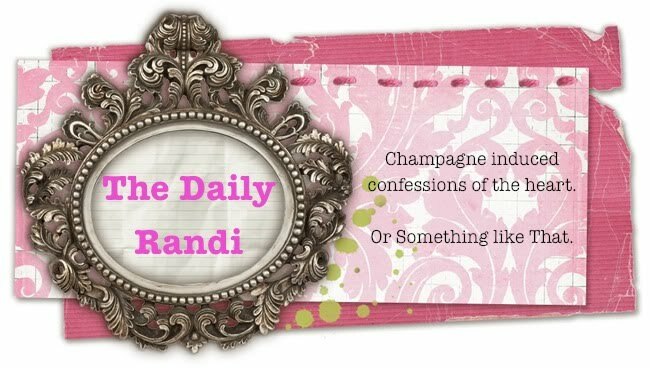 I love the slideshow from hell--too funny! great pumpkin farm .. did u carve any?